LONDON — Billions of years ago, the Earth's atmosphere was opaque and the planet's surface was a vast magma ocean devoid of life. Although many elements of the theory have been around for some time, Sleep's synthesis is "like putting together a jigsaw puzzle with some pieces already known and some that are speculative and have new aspects," said Dave Stevenson, a Caltech professor of planetary science who was not involved with Sleep's study. One of these new aspects is how Earth cooled down to the temperatures necessary for life to evolve, following the — presumed — giant impact that formed the moon. The processes Sleep discussed took place in the period called Hadean, about 4 billion to 4.5 billion years ago — before the first organisms came into being, and well before more complex life-forms, including dinosaurs, started roaming the Earth. Back then, the Earth was nothing like the blue Earth we know today. Instead, the entire Earth was hot and molten all the way to its inner core, a mixture of molten rock and liquid. No life would have been able to survive these brutally high temperatures, which reached 2,000degrees Celsius (more than 3,600 degrees Fahrenheit). Liquid water had no chance to form. The Earth's atmosphere at this time was also much heavier. Its mass was similar to that of today's oceans, and it pushed down on Earth's surface with a pressure of hundreds of bars. (For comparison, the average pressure at the Earth's surface today is 1 bar). It was also opaque — "you would not have been able to see much, just clouds covering everything," Stevenson said. Beneath the clouds, a magma ocean swayed, with partially molten rock pushed around by tides, Sleep thinks. These tides were due to the mutual attraction of the Earth and the moon, and were much stronger than those in today’s watery oceans, as the moon was sitting much, much closer to the Earth back then. The tides constantly stirred the ocean, causing the mantle to lose heat, similar to stirring and blowing on a bowl of soup. But once released from the Earth's depths, the heat was trapped at the surface, held back by the thick, opaque primordial atmosphere. The heat could only escape the planet (and cool it down) at so-called cloud-top temperature levels — where it would be as cold as on a modern high mountain summit. But for the first 10 million years, the temperatures were much, much higher, Sleep said. 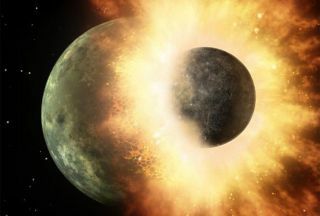 The energy loss caused by the mutual attraction of the Earth and the moon was also making the moon gradually pull away. This made the tides progressively weaker, so the molten rock was being stirred less and less, and the Earth's mantle began to solidify in stages. "While at the top of the Earth there was still partially molten slurry with a bit of liquid left, in the middle there was a mushy layer, but the deep mantle was becoming solid,” Sleep said. "Lava was probably still coming up and erupting and freezing at the top, and then falling back in large, kilometer-size pieces that were sinking into the Earth." Slowly, the internal heat flow ceased to dominate the climate, and the temperatures at the surface began to drop, with the heat being able to escape the atmosphere at last. The sweltering temperatures and trapped heat were not the only obstacles for life to appear, Sleep said. Another issue was overabundance of carbon dioxide in the primordial atmosphere. Carbon dioxide doesn't dissolve in molten rock, so it was bound to bubble up from the magma ocean, creating a so-called runaway greenhouse effect, Sleep said. For the Earth to become habitable, most of this carbon dioxide had to vanish. Sleep said this happened when the tectonic plates began to move in the late Hadean, some 4.4 billion years ago. With the plates moving, the carbon dioxide began to enter the mantle in a process called subduction, when one tectonic plate moves under another and sinks into the mantle. Liquid water oceans had already begun to condense around that time, and once the Earth cooled sufficiently and most of the carbon dioxide was safely tucked away in the mantle, life did finally appear, Sleep said, adding that chances are that this life arrived on Earth from Mars. And if conditions on Earth were just right for life to start, this Martian rock could've been the beginning of everything we know today. But it’s still only an idea, yet a testable one. Unlike Earth, though, the ancient geological record exists on Mars, Sleep said. It is just hard to examine.